This article reports on field experience of unvented cathedralized (UC) attics in the U.S. Traditionally, in some regions of the country, slab on grade construction is a preferred mode of construction. Mechanical equipment for air conditioning and distribution ducts are usually located in the attic spaces to conserve space. Conventional construction involves providing insulation on the floor of the attic and venting the attic space to the outside leading to loss in efficiency in operation of the equipment and through duct leakage. Insulating the attic roof itself and blocking of ventilation to the outside transfers the air and thermal energy controls from the boundary with the living space to the plane of the roof. The air distribution systems now fall within conditioned space, which increases their efficiency, durability, and maintainability. 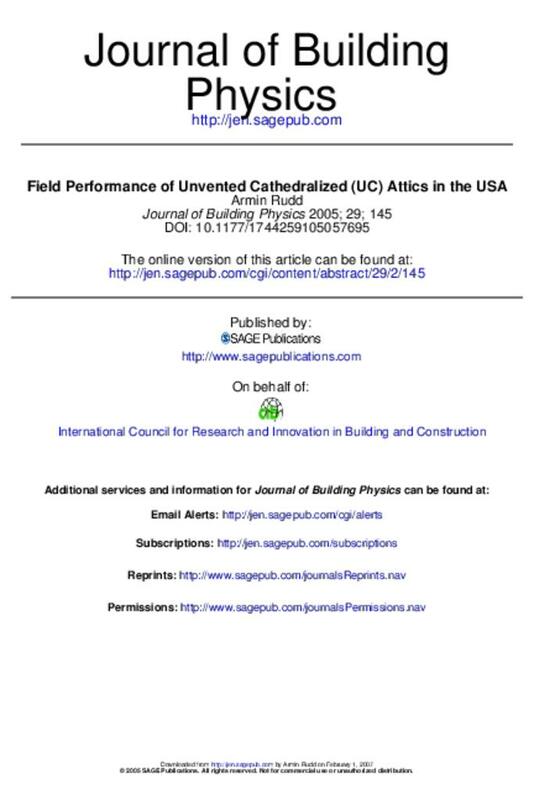 This article was first published in the Journal of Building Physics, Vol. 29, October 2005. Traditionally, in some regios of the United States, because of high water tables or the risk of flash flooding and lower cost, slab on grade construction is a preferred mode of construction for residential buildings. Mechanical equipment for air conditioning and distribution ducts are usually located in the attic spaces for convenience and to conserve space. Conventional construction involves providing insulation on the floor of the attic and venting the attic space to the outside. The loss in efficiency in operation of the mechanical equipment located there and losses by duct leakage do not lead to sustainable design. Insulating the attic roof itself and blocking of ventilation to the outside transfers the air and thermal energy control surfaces from the boundary with the living space to the plane of the roof, which resulst in an unvented cathedralized (UC) attic (Rose, 1995). By this approach, the air distribution system located there is in conditioned space and losses there are of lesser consequence. An UC attic differs from a cathedral ceiling, whether vented or unvented, in that the cathedral ceiling has an interior finish installed beneath the roof rafters and insulation. In the case of an attic, which is usually encumbered with more structural framing, the insulation and framing are left exposed. The earliest form of UC attics used in residential construciton employed polyurethane spray foam insulation adhered directly to the underside of the roof sheathing and gable end walls. This has been especially successful in hot-humid regions to remedy moisture-related problems caused by the condensation of moist air on cool supply air ducts or on gypsum wallboard surfaces (Lstiburek, 1993). While the extra expense of correcting a moisture problem can be easily justified, it is often difficult to use this premium option for price-sensitive new construction. Hence, less expensive insulation systems have been used extensively, such as netted-and-blown cellulose (blown-in-blanket), and strapped-in-place fiberglass batts. The spray foam application inherently eliminates air movement, whereas the fibrous insulation applications allow air movement which, depending on the sheathing temperature, can lead to moisture condensation under the roof sheathing. Proper design and choice of materials is needed to avoid long periods of moisture condensation. Of the three materials noted above, fiberglass batts are the easiest to install and they provide a high insulation R-value in a uniform thickness. Spray foam is generally less uniform in thickness than fiberglass batts but more uniform than netted cellulose because the netting droops between framing members. Although it can be applied thicker, spray foam is generally not applied to supply an R-value higher than 20 hft2°F/Btu (3.52 m2K/W) whether the foam is of medium density i.e., the foam used for wall applications 1.5-2 lb/ft3 (24-32 kg/m3) or open-cell, low density foam 0.5 lb/ft3 (8 kg/m3). Spray foam applicators generally consider R-20 to be an optimum level, especially considering the air sealing capability of the material. Likewise, cathedralized netted cellulose insulation is generally installed to an effective R-value of 22 ft2°F/Btu (3.87 m2K/W). Properly applied, the UC attic approach provides a high value in energy efficiency, durability, and maintainability. It is more energy efficient primarily because the attic mounted air distribution components are all inside the thermal insulation and the air pressure boudnary of the conditioned space. This has been shown to provide substantial benefit in both summer and winter (Rudd et al., 2000; Hedrick, 20003; Henderson et al., 2003). It is more energy efficient because, with many ceiling penetrations an height changes, it is often easier to air seal the building enclosure at the roof line instead of the ceiling. It is more durable and maintainable because the mechanical equipment is inside a mild environment, and the services above the ceiling level are left exposed for easy maintenance, repair, or upgrading. It is safer in fire events and windstorms due to the lack of soffit vents and other vent penetrations that intensify the spread of fire and increase air pressure forces on roof sheathing. Research on the UC attic approach started with computer simulations, showing that, compared to conventional vented attic with normal duct leakage and code level duct insulation, significant annual energy savings could be realized (Rudd and Lstiburek, 1998). Production prototypes were constructed in Las Vegas in 1996, which underwent extensive testing and performance monitoring (Rudd et al., 1996). In addition to exceeding Energy Star energy performance, the houses met strict criteria for building enclosure leakage, duct leakage, and pressure balancing. Controlled mechanical ventilation was also standard. The success of this approach encouraged the builder to make it standard, and the system was later replicated in Arizona, Texas, Florida, and California. Thousands of dwellings have been constructed in this way and testing and performance monitoring studies have continued. How much is the insulation under the asphalt roofing increasing their temperature? Does this increase affect the durability of the shingles? Can the insulation be air and vapor permeable or not? Does the placement of insulation affect the requirements for vapor diffusion resistance beneath asphalt roofing materials? How do the thermal and moisture requirements vary with the climatic conditions? To examine the relationships between the construction pattern and the climate, case studies are presented by different climatic regions starting with warm and dry climates. An important hurdle in California and parts of Arizona was to be able to claim the benefit of having the air distribution ducts inside conditioned space without having to actively condition the US attic (Walker, 2004). For dwellings with an UC attic, the ceiling is not constructed airtight as it would be for houses with a vented attic. Therefore, there is natural air exchange between the living space and the UC attic. In addition, even though the duct systems are sealed, there is always some leakage, especially at the air handler cabinet, which adds to the indirect conditioning of the cathedralized attic. The indirectly conditioned UC space may be considered, for the purpose of energy performance, the same as the conditioned space. The small temperature differences measured between the living space and the UC attic provide the evidence to this end. The small differences were measured for both average and peak temperature difference. When using the UC attic approach, one needs to provide criteria by which the UC attic could be qualified as having sufficiently low air leakage to the outdoors. Data were collected and analyzed to demonstrate that the thermal air distribution system, located inside the UC attic, was for all intents purposes inside the conditioned space. A combination of pressure differentials and air leakage measurements could create a set of criteria to bound the acceptability of a given UC attic construction as one that would corroborate the predicted performance by measured temperature conditions in the attic and the living space. The next set of studies involved cold climates. Application of the UC attic in cold climates can be especially effective if air distribution ducts are located in the attic. Heat loss from ducts in cold northern attics is significant (Petrie et al. 2004). However, when cold temperatures prevail for extended periods, it is doubly important to avoid moisture condensation on roof sheathing. Air impermeable polyurethane spray foam applied continuously and directly to the underside of the roof sheating and framing is preferred. This keeps interior moisture, carried by air movement, from contacting the cold roof surfaces. There are other methods and materials for installing air impermeable insulation, but whatever is done, the warm moist interior air must not contact the cold roof sheathing or framing (TenWolde and Rose, 1998); Rose and TenWolde, 2002). Many homes in northern cold climates are humidified during winter. Ordinarily, there is no reason to humidify to more than 35% relative humidity (RH). If higher RH conditions exist for extended periods (days to weeks), then a vapor retarder paint or film may have to be considered to protect the surface of vapor permeable insulation . . .